With some stroke of luck, I was able to get my wife to tag along during my business/vacation trip in Singapore. Me and my wife decided not to schedule other travels this month since the rainy season has already started and because we wanted to prepare very much for Singapore. From the countless stories we’ve heard from friends and relatives, we were convinced we could face some steep spending there so we thought our wallets and credit limits could use some rest and make sure they are in the best shape when we trot around the Lion City. Indeed, Singapore was brimming with sights and things to do and to say that it is one great travel destination is an understatement and something sort of like re-inventing the wheel. We know a lot of friends that have gone to Singapore telling tales of the wonderful locations they went to and the irresistible shopping deals they came across with and that helped us to realize that we didn’t want the stereotypical Singapore Trip but instead we wanted the well-rounded experience – we wanted to find the “Sense of Place” in Singapore. 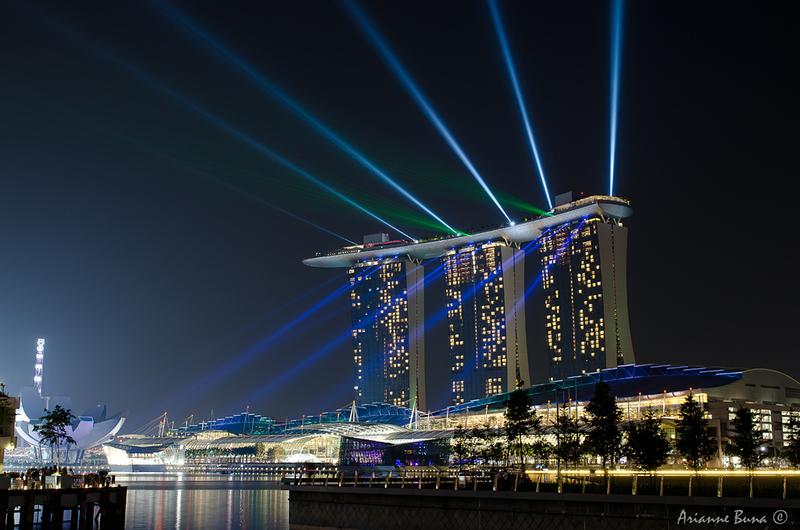 The countless choices of places to go and things to try out will totally disorient anyone upon setting foot in Singapore City. In our case, we found it best to really identify first what we wanted – a gameplan of sort and work our itineraries according to that. Without any debate, me and my wife agreed that we prioritize the “Cultural” rather than the “Urban” Singapore experience. 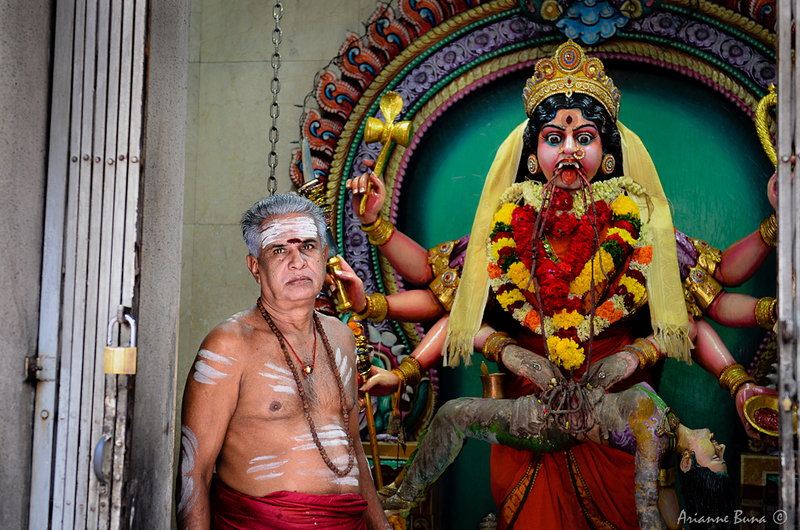 We thought that it’s the fusion of different cultures that makes Singapore the unique and vibrant city that it is and we were not disappointed going down that route. 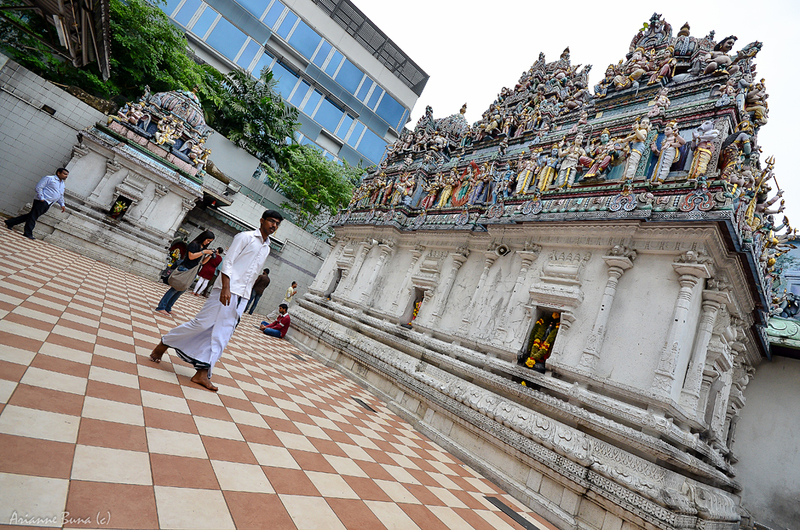 The three major cultural groups in Singapore are comprised of the Chinese, Indians(Tamils) and the Malays. Although Filipinos are scattered everywhere like we always are anyway, we didn’t make it along with the big three. 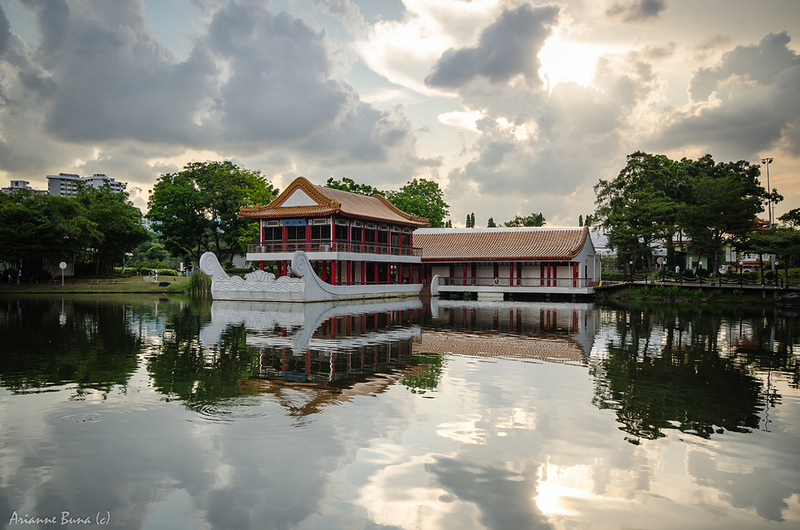 We chose to visit first the destinations representing these cultural groups and if we are lucky to have time to spare, we can go on and see the Urban sights of Singapore. Fortunately, Singapore’s public transport system is well designed and very practical that there is no landmark that you cannot reach without any or the combination of the MRT or the Public Bus. In Singapore, unless you are the anti-social type or have money to spend you can forget about the Taxi. When me and my wife figured out how to go about the city hopping in and out of the different MRT lines, there was no stopping us where to go next. 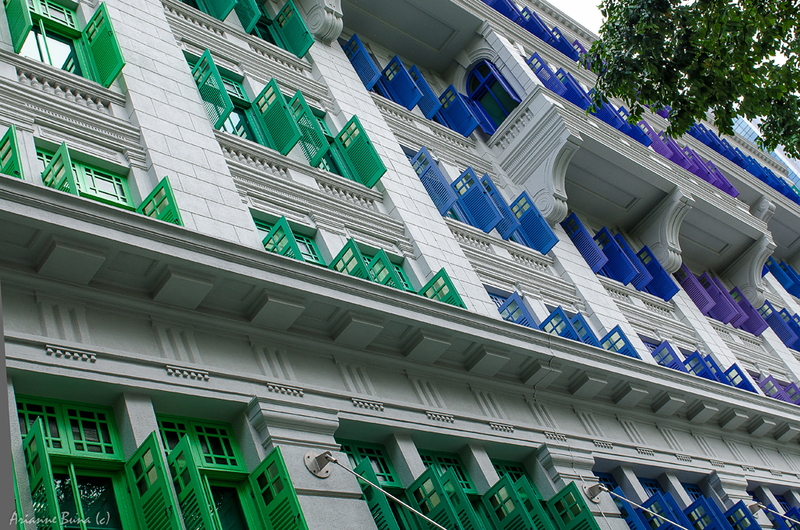 Having booked our accommodation at a hotel in Little India, we decided to explore this side of Singapore first. 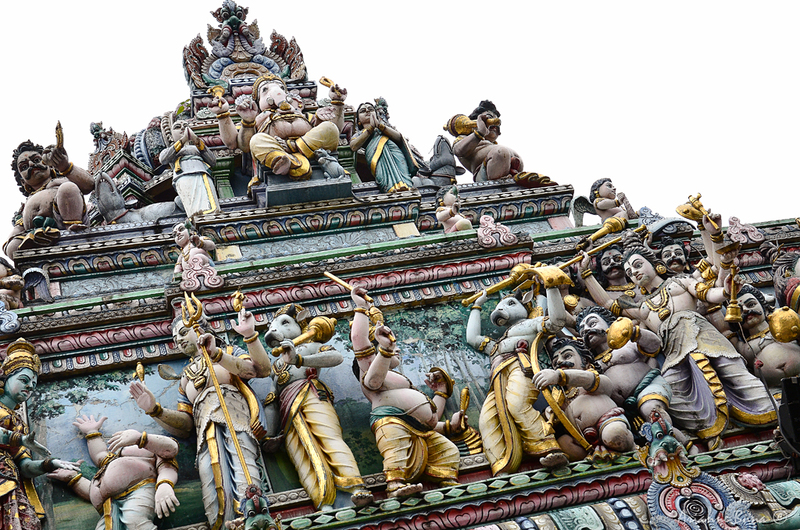 Our first stop was the Sri Veerama Kaliamman Temple that is not very difficult to miss with its colourful and intricately carved murals covering the temple domes. Nearly reluctant to enter the temple premises and just contenting ourselves to admiring the temple from across the street, we finally went in when we found others tourists entering the temple without any problems. Yes, shutterbugs we may be but being a place of worship, we were very careful not to upset the locals. 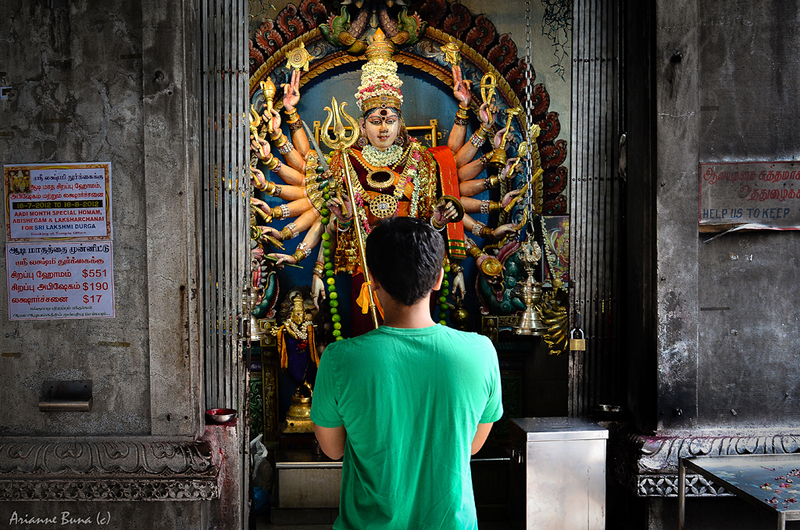 Ironically, when we entered the temples we even found a small group conducting a photography walk inside the grounds. The locals were generally shy and it was difficult to chance upon worshippers praying in front of their Gods as they tend to finish their prayers quickly when they know somebody was shooting at them. After several attempts I felt not to disrupt the locals any further and just leave them do their prayers peacefully. Time passed by quickly in the temple and after some Street Photography along Serangoon Road the next thing we knew was that it was already dark. We detoured from Little India and decided to take dinner first and since most of Little India’s temple won’t be any good in the dark, we went to Marina Bay afterwards. The Marina Bay Sands hotel did not disappoint as we nearly drained our camera batteries shooting long exposure shots of the bay and the Hotel from every angle imaginable. Minus the view, the Marina Bayfront at night is not far from what you’d see in the Philippines. Every now and then you’d see some love-struck couples lost in their bubble, some anonymous guy snoozing away in one of the benches and some avid health buff going for a night run. The nightscape around the bay was just spectacular that after having our fill of the Marina Bay Sand Hotel we walked further hoping to get closer to the gleaming Fullerton Hotel and the Singapore Omni-Theatre, Esplanade Theatre (which looks like a thousand miniature Sydney Opera Houses by the way) and the famous Merlion Statue. Unfortunately, we found that the Merlion Statue was under makeover and was covered with tarpaulins and scaffolds. 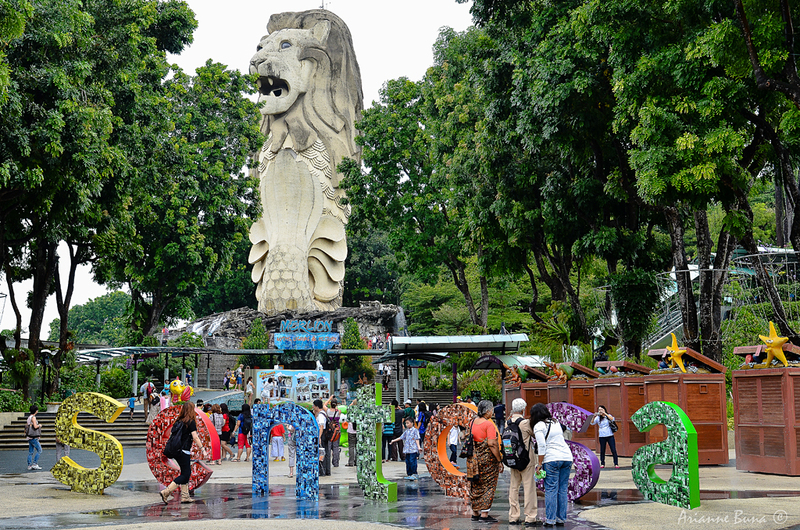 We were a bit disappointed having to miss this iconic landmark in our trip but as a consolation, we stumbled on another Merlion statue in our second-to-the-last day in Singapore at Sentosa Island although this one didn’t spit out water but looked like it wanted to munch on tree leaves. 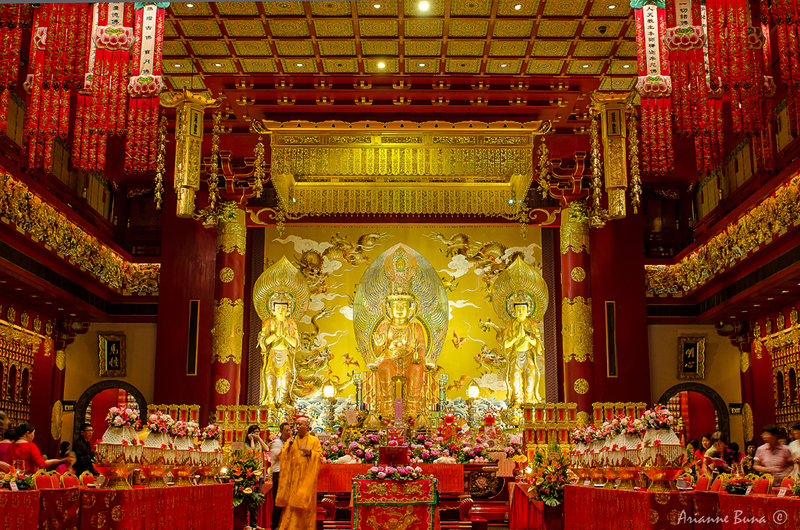 We headed off for Chinatown the following day looking for the Buddha Tooth Relic Temple which was packed with visitors and locals when we arrived. Later, we found out that some kind of religious convention was happening on that day which was very fortunate for us as numbers of monks in orange robes and maroon sashes flooded the place. I realized this was were the monks we’re seeing in the MRT were going to. Besides monks some devout local parishioners (I believe) were in their black robes and participating in the event as well. Not really understanding what’s going on, I think they were chanting a repeating prayer in unison something similar to how Catholics would pray the Rosary. Despite of the event, tourists were still everywhere and like us admiring the whole celebration at the same time discreetly taking photos inside the temple. Right there, it was easy to realize the many obvious as well as quirky differences between the Hindu and the Chinese Temples. But in any case they all deserve respect and that’s what we tried as much to do. 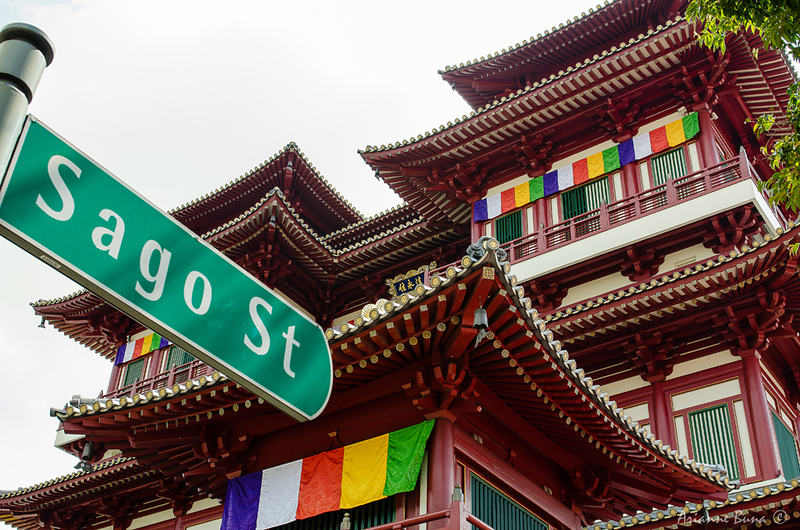 After the Temple, it was the bustling Chinatown Street which we had to tread on midday. Too bad, the red Chinese lanterns dotted on the streets would have been a pretty sight in the evening. But anyway, It was an interesting walk still as you find out stores selling nothing but Hello Kitty stuff, antique shops selling “rare” stones, curiosity shops where you can get your name engraved on a grain of rice, even an authentic Tin Tin store and of course – Chili Crab restaurants. Me and my wife didn’t get to try even a tiny bit of Chili Crab in Singapore first was because we just recently ate crabs before coming to Singapore and next was I didn’t want to be bothered by high blood pressure during this trip. Yes, spoil sport I admit but I’ve tasted quite a lot of Chili Crabs in the Philippines and impressive as its reputation might be, I was pretty sure the Chili Crabs in Singapore at most will just be a close permutation of the ones I already tasted. Besides, we had to be on the go and had a lot to cover. Don’t worry, just because we didn’t have the appetite for Chilli Crabs on this trip doesn’t mean we didn’t splurged on food. I’ll be preparing a separate blog for our food escapades. Hint: I left for Singapore 73kg and returned to Philippines 76 kg. The next day our stop was the Malay Heritage Town. 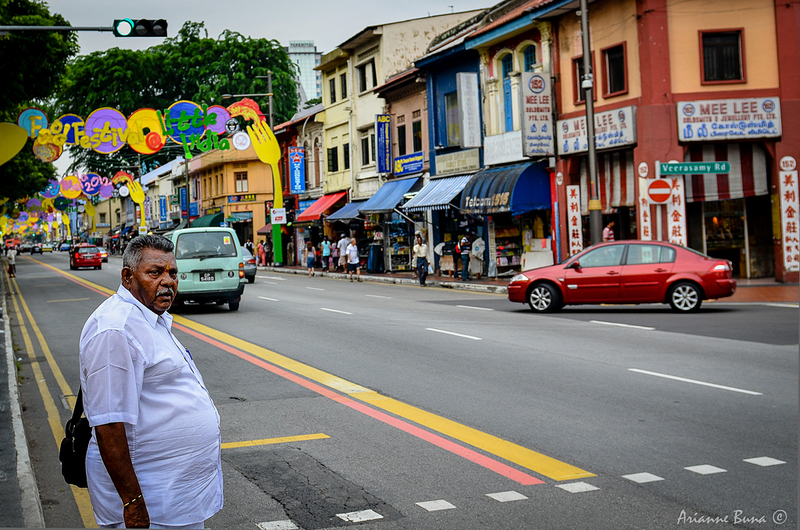 Of the two previous cultural districts we’ve been, the Malay district was the most quiet and orderly to be honest. 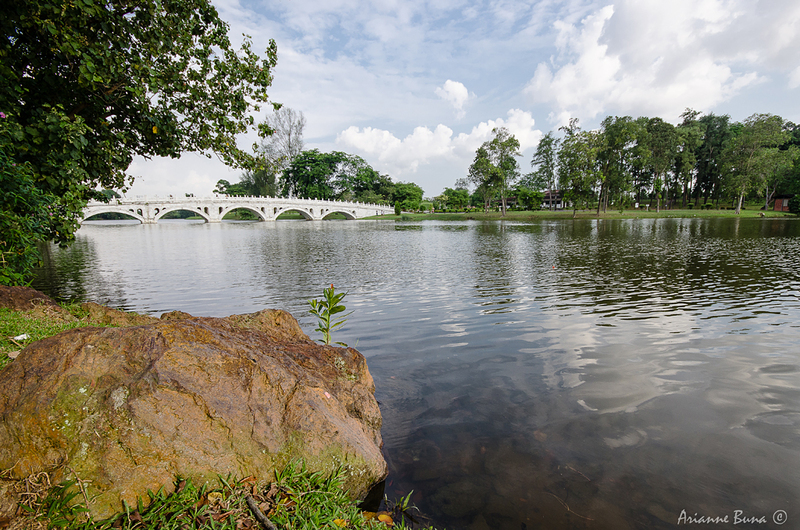 But unlike the two, the Malay Heritage Town had fewer landmarks but some construction going particularly on the Malay Heritage Centre and the Arab Street tell that they are not left out by the government and will soon be bustling with visitors. 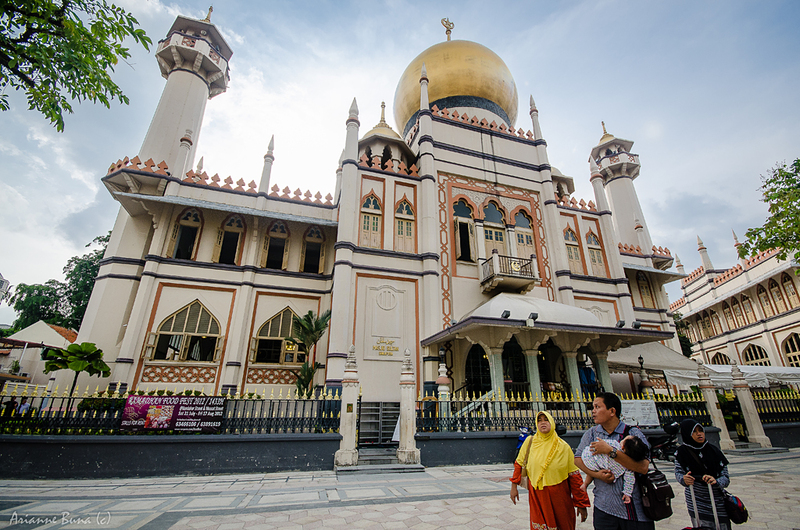 The Sultan Mosque was the most prominent and imposing landmark upon reaching the heart of the Malay District. The golden dome and the artwork surrounding the temple windows unmistakably reflect the Muslim heritage of the place. Together with the clothing styles of the locals in the area gives you the impression that you are in a totally different place. 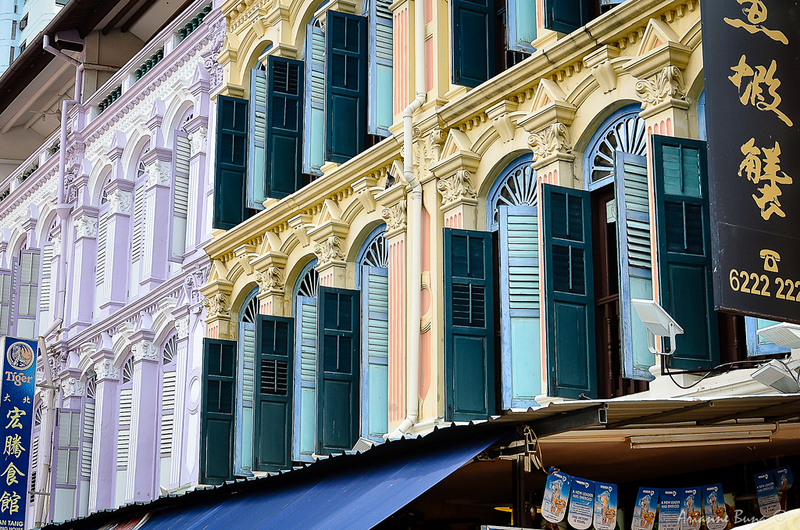 Since getting to Singapore, I’ve been admiring the meticulously adorned windows and verandas on old houses. I’ve read before that the government exercises an active role in preserving these old houses despite allowing them to be opened for businesses. Even signboards, I learned have controlled dimensions to promote the visual appeal of the old houses. This is one among many things our country can pick up particularly the current situation in Batanes where the old heritage houses are steadily becoming outnumbered by more updated houses. How I wish I could have gone up to one of the windows of these houses to see up close the details. 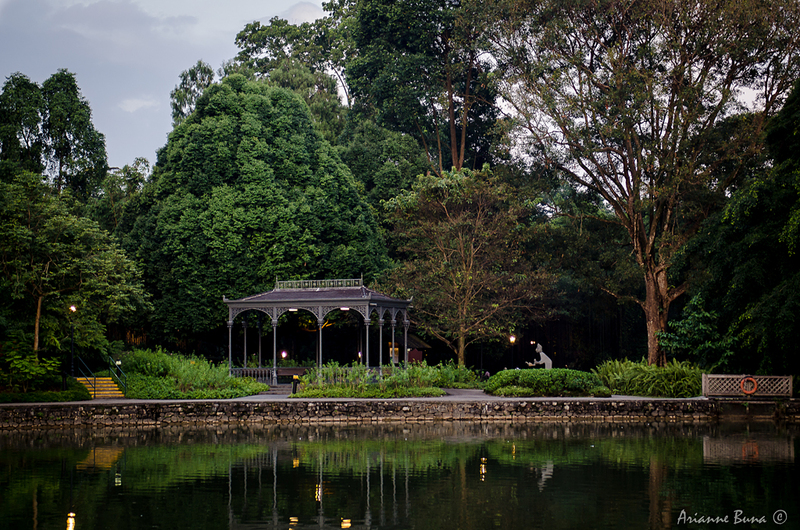 The subsequent days had our sightseeing mellow down as I went on to attend my original purpose of travel to Singapore which was to attend a Training Course. 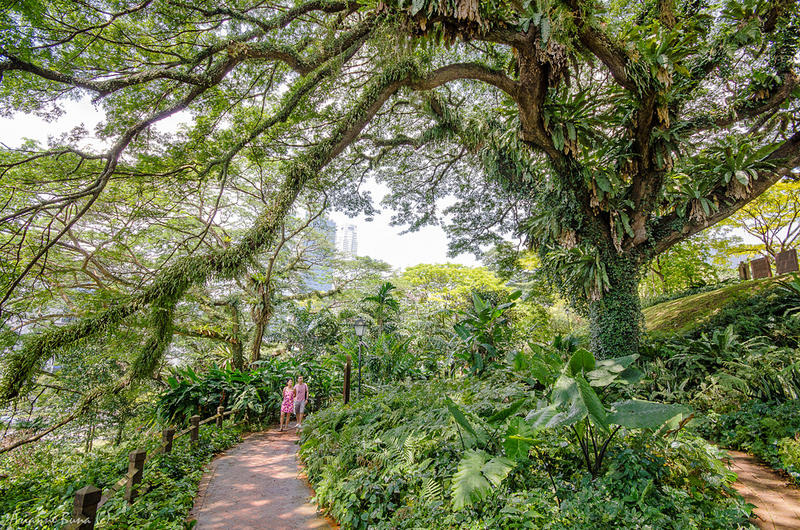 My wife had to continue with the sightseeing by herself which led her to the Singapore Botanical Gardens and back to Chinatown to buy some trinkets to give away when we go home. 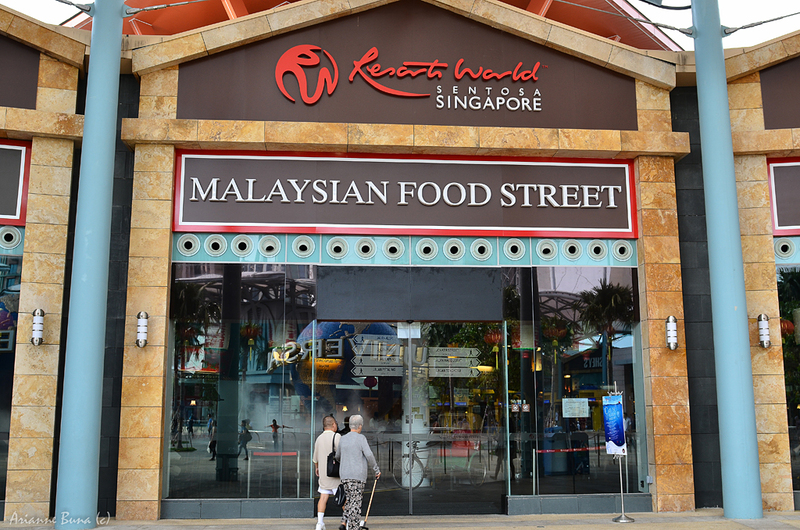 We felt we’ve seen the major landmarks representing each of the Cultural groups in Singapore and decided we can set aside our final day in Singapore in Sentosa Island. But before going to that, we had to drop by the Gardens by the Bay which just recently opened a few days ago. Coming out of the Bayfront Station, we saw the “Supertrees” ominously standing up from beyond the Dragonfly Lake. It was still a few minutes past sundown so the sky still had some bluish hue on it and the Supertrees were not yet fully lit not making for a very interesting scene. 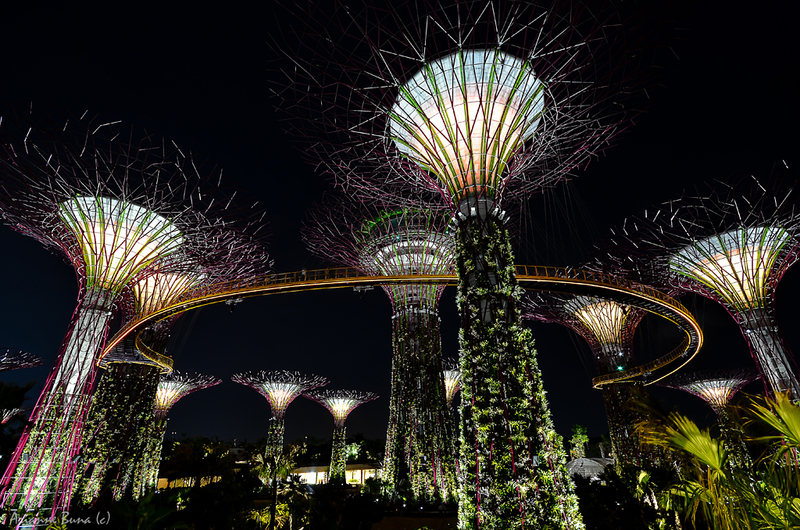 We decided to enter the gardens through the Dragonfly Bridge and made our way to the Supertree Grove. 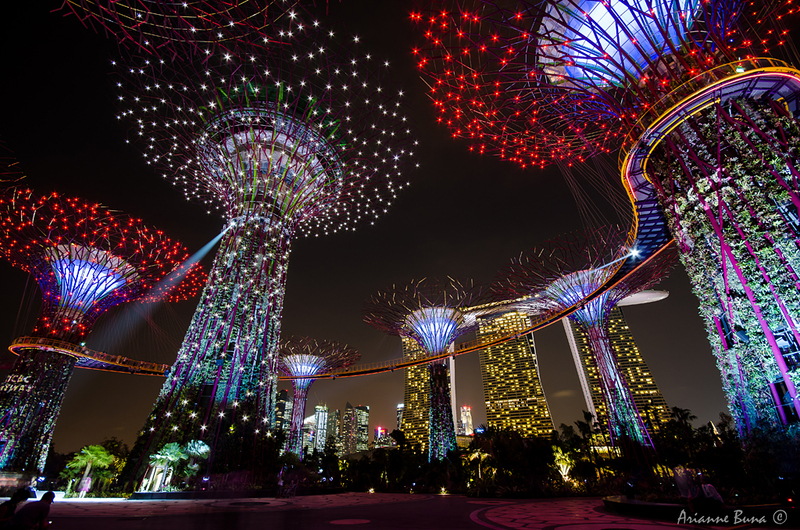 By that time it was already dark and it was the Supertrees time to shine. Nothing like we’ve seen before or even heard of, the carefully designed fusion of metal, lights and vegetation really lived up to its hype and probably more. The Marina Bay Sands Hotel in the backdrop also added an extra punch to the already stunning view. Right there it was time to set-up tripods and we contented ourselves with long exposure shots. 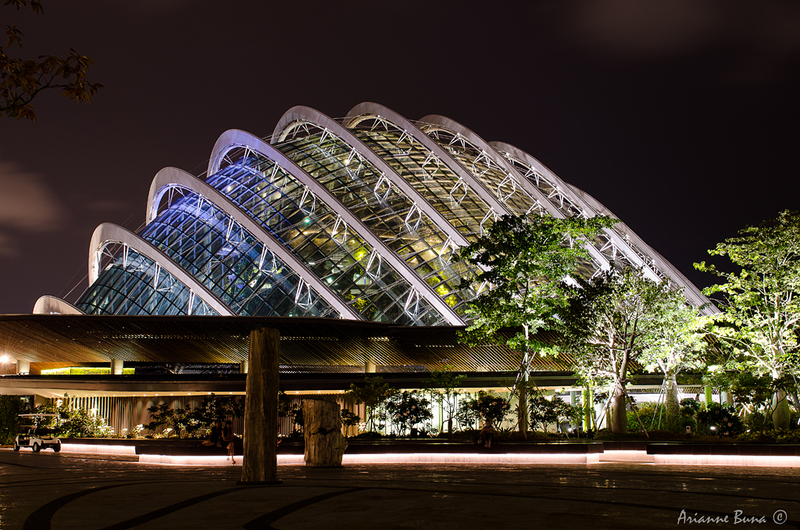 By the time we were finished shooting, the ticket booth that allows you to go up the bridge joining the Supertrees was already closed but the awe went on as the light show which they call as OCBC Garden Rhapsody started . Soon we realized our vantage point from one of the benches was not bad after all. 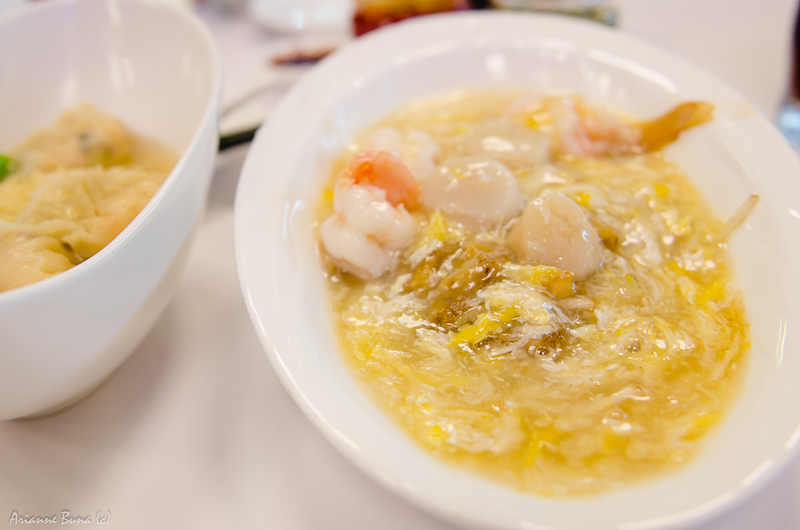 We had our dinner at the Peach Garden Noodle House which served the best tasting and most enticingly plated Hor Fun I had so far. After that, it was time to head back to Little India for a well deserved rest. We were down to our last full day in Singapore and surprisingly our energy levels were still high. Not minding the sore foot from all the walking we did or the disturbingly bloated feeling from the eating binges, we headed on to the Harbourfront Station to make our way to Sentosa Island. It was raining heavily when we arrived at the Harbourfront and we had to spent around an hour strolling around the station Mall before starting to look for the Cable Car Station. It was very hot and humid totally unnatural considering it just stopped raining but we managed to find the Cable Car station and were soon headed to Sentosa Island. The cable car had an Angry Birds theme at that time and was very apparent with all the stickers and advertisements plus the large Angry Bird stuff toy passengers can cuddle. This time, we did not have any particular destination in mind so we just let our legs decide where to go. Eventually, we reached the Merlion Plaza where we saw a gigantic statue of the Merlion. I thought it was a fair enough consolation for missing the original Merlion at the Marina Bay. 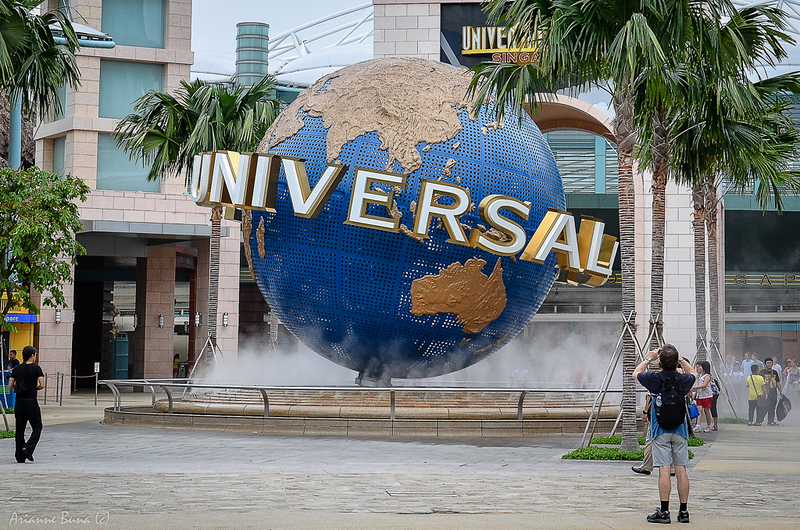 Next stop was the Resorts World Sentosa where the well-known Universal Studios is located and the Maritime Experiential Museum. This innocent looking area is a treasure trove of gastronomic proportions. 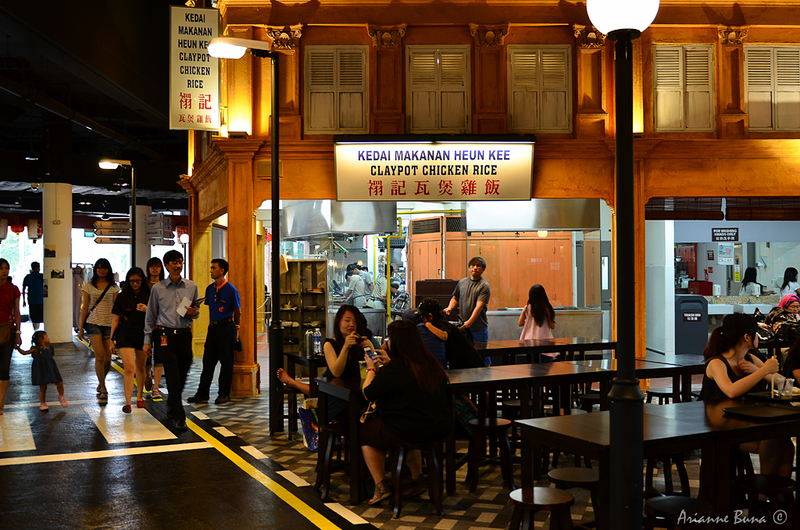 All of the famous hawker stalls in Malaysia are represented inside this foodcourt presenting endless choices of authentic Malaysian and Fusion cuisine. Again, time went by so fast and soon it was sundown. We would have gone to see Siloso Point and the beaches but our old friends who live now in Singapore began texting starting to look for us. It was a great experience to say the least and it was true that one day is not enough in Sentosa Island. Our final day in Singapore finally arrived and we strangely find ourselves less cheerful than in the other places we’ve been to. We thought it was clearly a reflection of what we felt and that is wanting to stay longer. We were like kids let out of the playpen arriving in Singapore and we did enjoy every moment of it. This time pulling the plug was not as easy as Puerto Princesa or as waving goodbye to Paris. 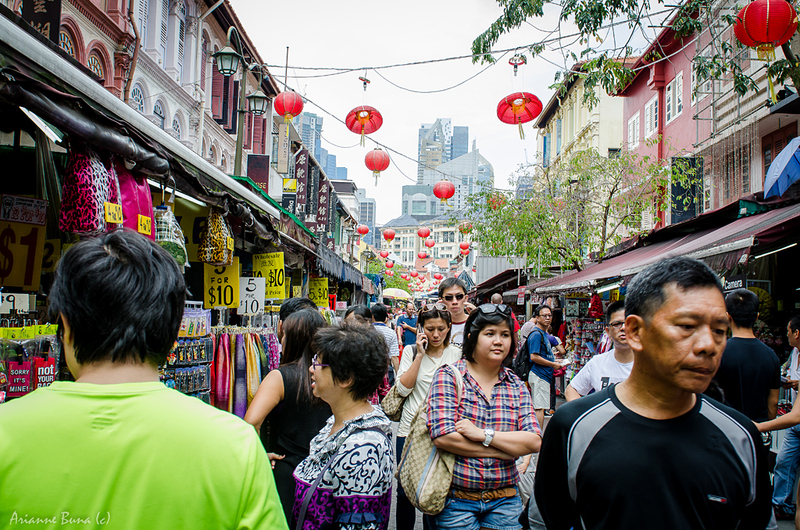 Singapore was different and diverse but it was easy to be accustomed with. It was like nursing a hangover returning to the Philippines looking at the skyscrapers and wishing they could be a bit brighter and the skyline a little more exciting. But this is where I live and this is where I belong. I shouldn’t be hung-up with wanting to stay in another country but I should be proud to be able to get there and back to tell the story. But what makes me prouder? After some haggling with the taxi driver and as we spiralled down the interchange, Traffic greets us. Taxi driver responds sounding off his horn in succession, Jeepney cuts us from the right, Motorcycles on the left, peddlers on the sidewalk and pedestrians everywhere. I knew I was right where I should be…I was home. This entry was posted on July 15, 2012 by arianne1981. It was filed under Travels and was tagged with Chinatown, Gardens by the Bay, Hawker Food, Hor Fun, Long Exposure, Marina Bay, repetition, Sentosa, Singapore, Universal Studios. 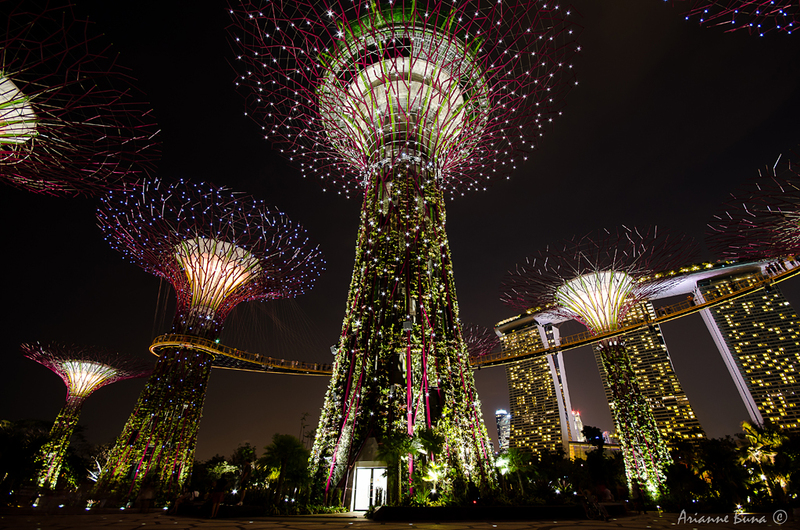 “Singapore was different and diverse but it was easy to be accustomed with.” – madaling main-love sa bansang yan! 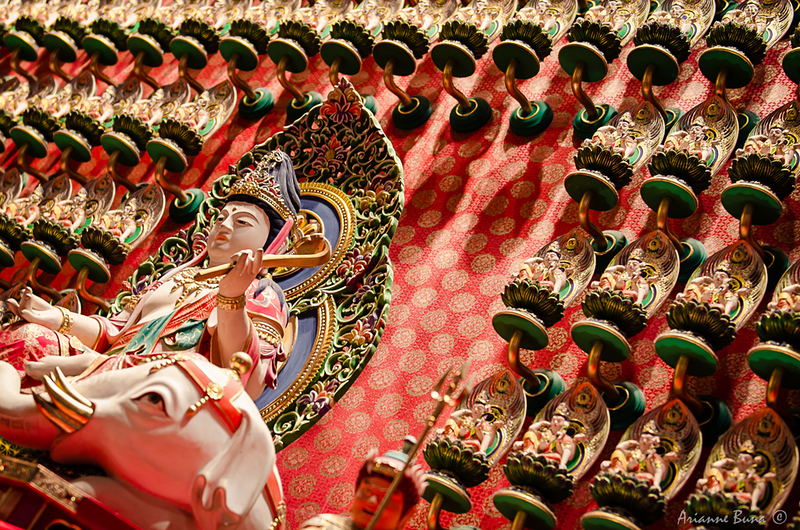 excellent travelogue and photos here. The first photo really really rocks! 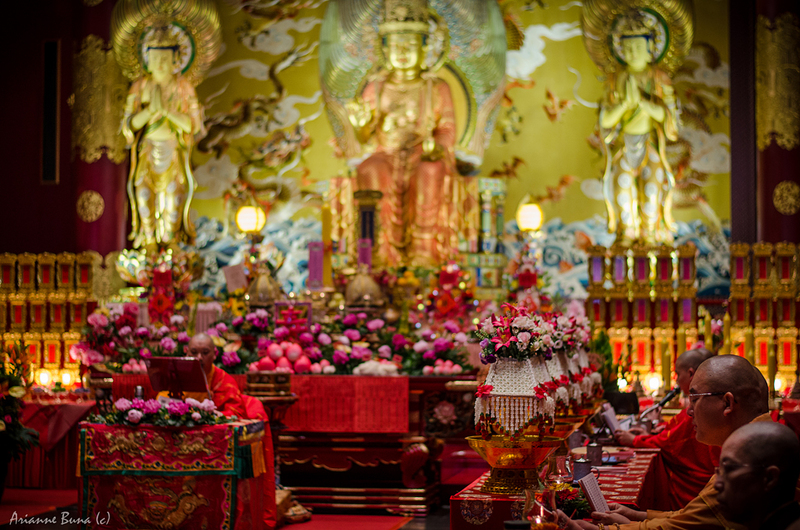 Like you, I was lucky enough to visit the Chinese temple during the chants. Very beautiful. Thanks for helping me relive that moment.